Today I found out the difference between an asteroid and a comet. A comet is simply a relatively small astronomical object that has a “tail”, known as a coma, which makes up a temporary atmosphere for the comet. Asteroids, on the other hand, do not exhibit this tail and are classically defined as simply an astronomical object that orbits around the Sun, but isn’t a planet or a comet. The tail of a comet is made from the Sun heating various substances in the comet, such as water in the form of ice, to beyond the boiling point level in the vacuum of space. These vaporized substances are then ejected from the comet and carried off by solar winds, creating the tail. This is why the tail of a comet always points away from the Sun, relative to the position of the comet, and not, as often depicted, directly behind the comet relative to its vector through space. These tails gave rise to the notion that comets were made mostly of ice surrounding some relatively small core with various particles embedded in the ice. Asteroids, on the other hand, are typically considered to be made up primarily of metals and various types of rocks that formed close enough to the Sun that most of the ice or other such relatively easily vaporized materials have long since been expelled. However, in just the last decade or so, it has been found that, in fact, this is not always the case and that the makeup of asteroids and comets is really not all that different, though the comets do typically have more ice, thanks to initially being formed beyond the “snow zone”. To study this and other things, in 2001, NASA’s Deep Space 1 team discovered that the surface of the comet Borrelly was not made up of ice, but rather, was very hot and completely dry, with no visible water or ice, much like many asteroids. Except, of course, the object was exhibiting a tail, so it was known that there had to be relatively easily vaporized matter in there somewhere. So, the theory at this point was that the ice must be just below the surface or there was some sort of matter covering the layer of ice, essentially blocking the ice from being observable. Further research in 2005 was done on the comet Tempel 1. In this case, they used a probe to blast a crater in this comet in order to have a look at the innards. What they found was that the above theory was correct and the ice is concentrated below the surface. From there, the distinction between a typical asteroid and a comet becomes murkier because some asteroids also are thought to contain significant amounts of water in the form of ice below their surface. Further, recent discoveries have shown that comet dust very closely resembles asteroid dust in makeup, contrary to former theories, suggesting they are made of much the same things, excepting the probable larger quantities of ice still remaining on the comets. So we once again come back to the main difference simply being that comets still have sufficient easily vaporizable material, principally water, that when they get within the inner part of our solar system, some of the water in the form of ice melts and is expelled, giving them nice “tails”. Eventually, all the water and other easily vaporized materials will all be ejected from the comet, which then becomes an asteroid. Can the Great Wall of China Be Seen From Space? In order to get around some of the nomenclature problems coming about as we learn more about the makeup of these various objects, in terms of what to call an asteroid, comet, small planet, etc, in 2006, “small Solar System body” was adopted to refer to any relatively small astronomical object like small planets, comets, asteroids, and the like. Another distinction between asteroids and comets used to be that comets have significantly greater orbits than asteroids, with some known to orbit at distances greater than an astounding 50,000 astronomical units (an AU being the distance between the Earth and the Sun). However, there are short-period objects that orbit at no greater distance than any of the planets in our solar system that are considered comets, and there are some asteroids that have larger orbits than some of these short period comets (with these very probably being depleted comets). There have even been comets very recently discovered that orbit in mostly circular orbits within our solar system’s asteroid belt; hence, why this particular distinction has started to be abandoned due to the ambiguity in these special cases. Using the “tail” definition of a comet vs. an asteroid, there are only around 4000 known comets vs. millions of asteroids that have been cataloged. Much earlier in our solar system’s development, the number of comets would probably have been significantly greater, with many of the asteroids today having once been comets, based on the tail definition. The largest known asteroid is Ceres, which is about 600 miles in diameter, while the smallest observable asteroids are just tens of yards in diameter. Comets have been observed throughout recorded history. They were almost universally considered extremely bad omens until as recently as the last couple centuries. Halley’s comet has been observed as far back as 240 BC, though it wasn’t until the 18th century that a man by the name of Edmond Halley realized that this one comet was the same one that had been appearing for centuries in a regular time interval. 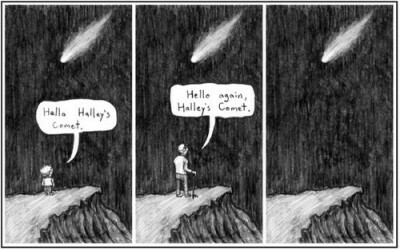 Halley’s comet will next appear around the middle of 2061, for those who are interested. A comet’s coma can be larger than the diameter of the Sun and the ionic part of the tail can be greater than 1 AU. When a comet’s orbital region intersects with the Earth’s orbit around the Sun, a meteor shower tends to result, thanks to particles ejected from the comet. These include: when the Earth passes through the Swift-Tuttle comet orbital region, which happens every year from August 9th to August 13th and in October, when the Earth passes through Halley’s comet’s orbit. There are currently around 7000 known asteroids that cross very close to the Earth’s orbit with about one thousand of these being larger than one kilometer. For reference, a meteor that is just 5-10 meters in diameter that hits the Earth, which happens about once per year, creates an explosion that is equivalent to about that of the bomb dropped on Hiroshima (about 15 kilotons of TNT), but of course, without the radiation problem. Lucky for us, these tend to explode high in the Earth’s atmosphere, and, thanks to the massive amount of energy they release, most of the matter is vaporized. Every couple million years, objects more like the above 1 kilometer or more sized meteors hit the Earth and even larger ones of 5 kilometers or more hit the Earth every ten or so million years. Those explosions are obviously much, much bigger and have a more devastating global impact. Our soonest known somewhat probable, relatively speaking, impact from an asteroid will come around March 16, 2880 with a probability of 1 in 300 that it will strike the Earth. The asteroid is simply labeled 29075 and is around one kilometer in size. Because of their relatively low mass, many comets and asteroids are irregularly shaped, rather than spherical like planetary sized objects, which are such thanks to gravitational forces. The blue-ish color of a comet’s tail is formed by electrons that have been stripped from the gasses ejected from the comet. This is not typically viewable by the human eye. Usually what the human eye is seeing is the dust trail. Amino acids, the building blocks of life, have been found on comets, specifically, the amino acid glycine. This was discovered thanks to NASA’s Stardust mission. VERY INFORMATIVE AND NICELY SCRIPTED. WENT BEYOND THE USUAL KNOWN FACT AND PROVIDED THE UNREVEALED DETAILS. BUT THE BEST PART WAS THE CARTOON (CANT EXPLAIN WHY I LIKE IT SO MUCH….I HAVE SAVED IT TO MY HARD DISK) ACCOMPANYING THE TEXT. I RECALL ONCE SEEING IT BEFORE ALSO IN SOME OTHER ARTICLE OF TIFO. ITS A SWEET-SAD CARTOON IF U GET WHAT I MEAN. RGDS. LOVEPAREEK. What will happen if the comet’s tail will vanish? Will it turn into an asteroid? Just asking.